Kelowna Human Resources is the leading provider of Career Transition Services in the Okanagan, offering Outplacement Programs to suit every need. We assist you in preparing and presenting yourself in the best possible light to potential employers. We are highly skilled and experienced in helping you plan and progress through each step to find and be ready for your next opportunity. We have a proven process and individualized coaching to ensure that your “brand” puts you ahead of the competition. 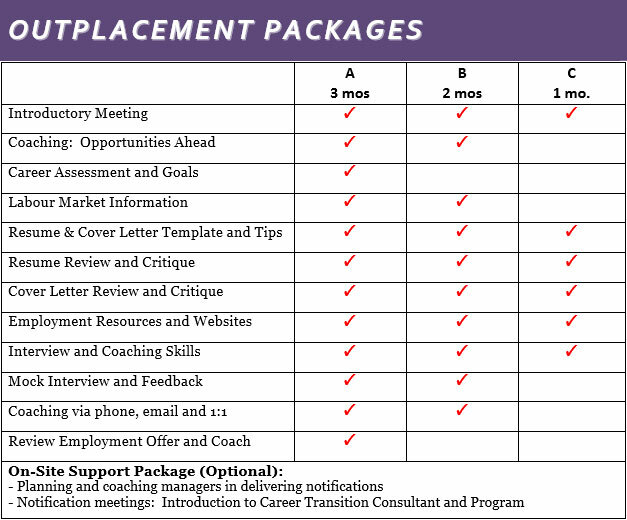 Below are programs available for clients who are looking to sponsor outplacement programs for displaced employees. We will review and discuss your present situation and help you develop desired opportunities (plan for the future) – in the same field, a career change or even self-employment. We will review your qualifications and talk about “market readiness as well as identify gaps. We will work with you to design and develop a professional resume that identifies what you have to offer – your key career highlights, attributes, skills and achievements. You will learn how to design targeted cover letters to specific opportunities and companies of interest as well as present yourself on LinkedIn and other job related sites in the best light. We are marketing specialists and will share our methodology with you to help you find those hidden opportunities as well as how to respond to ads and recruiting firms. We provide job sites/links to source career opportunities and recommend personnel agencies/recruiters in your field. Learn how to interview with ease to help prepare you and give you confidence. We will conduct practice interviews and offer feedback and hone your interviewing skills. We provide negotiation strategies and BC salary survey information as well as sharing tips for starting a new job – making positive impressions and creating success. For more information about our Career Transition and Outplacement programs, please contact Elizabeth Neef at elizabeth@kelownahr.com or 250-826-6964.